For the Arts Milton Community Art Project we decided to do a 3-dimensional project. There was a little prep required for this project but it was all worth it. Home Depot Milton our gracious sponsor for the Arts Milton community project every year, fabricated wooden cubes in varying sizes between 2 feet to 5 feet. I decided to go with the grain of the wood and outlined the organic forms and shapes. It was a joy to see the transformation of these wooden cubes when residents from the community filled these organic forms with bright, bold colours. As we are getting ready to make 2014 awesome… I think its only fair that I thank 2013 for everything it did for me. What an incredible year it has been!!! I can only feel utmost gratitude whilst reflecting on all the highs that this year blessed me with like meeting extraordinary human beings some of whom I have the honor of calling friends. You know who you are and I thank you for your friendship and support. It is said that ‘a home is not made of bricks and mortar, but built with love and a sense of belonging’. These words aptly describe my feeling of belonging since we made Milton our home. 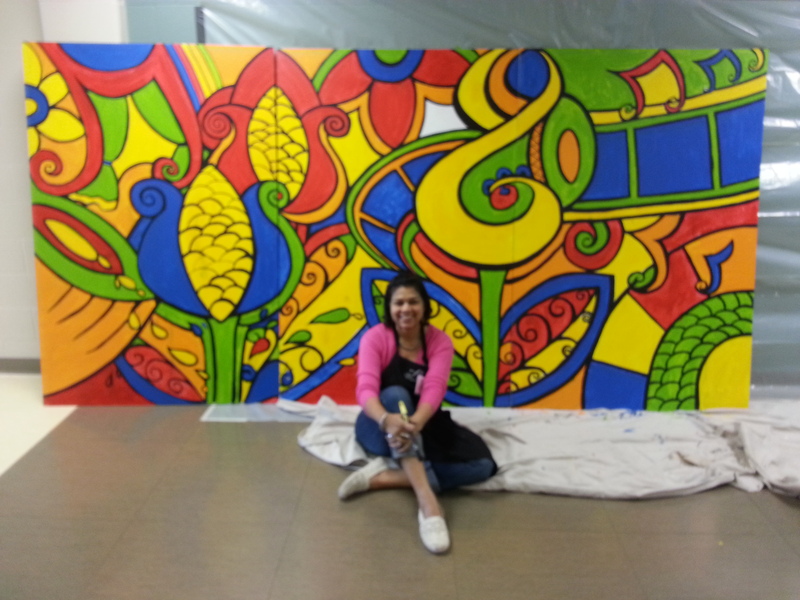 And as if to mark this sense of belonging, I had the privilege to facilitate a community mural for Arts Milton during the Culture Days 2013 – a liberating experience seeing the young and young at heart so candidly revealing their creative side. It did not stop there…I was honored with a huge opportunity to create a mural depicting the arts & culture landscape in Canada which is on display at the Vivian Lane, Rose Theatre. It also gave me my first award in Canada – yes, plaque and all! 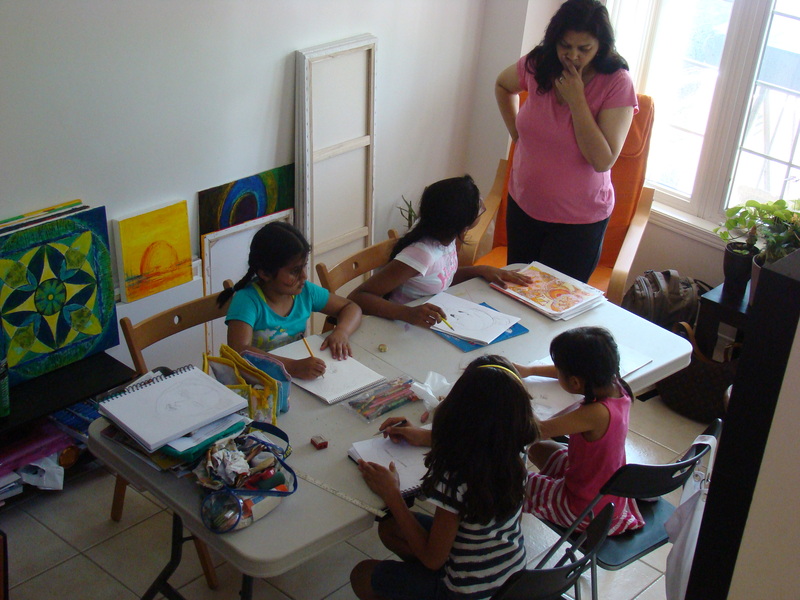 I have been teaching art techniques and painting for a long time now and besides one on one art lessons from home in Milton, I decided to take it a notch higher and have partnered with Learna preschool and Tutoring to start art classes in Milton in their facility. Oh!!! and finally a new addition to the family – our golden boy, Mylo! 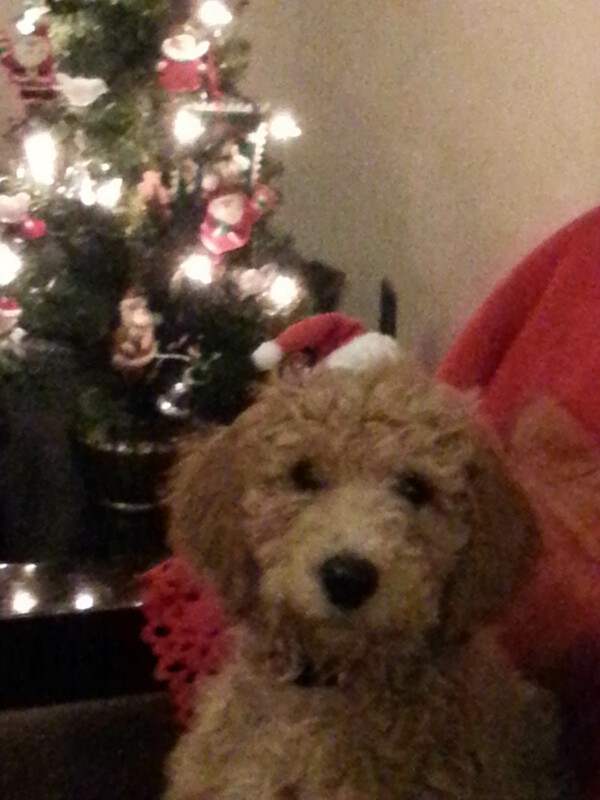 Our Golden Doodle puppy. Such a delight to have him in our lives. Its like he completed our family. Would love to know your best moments of 2013. Feel free to share or leave a comment. As a part of the ongoing efforts of making Brampton Downtown the hub for the fine arts, under the sponsorship of The City of Brampton and guidance of Brampton Arts Council, Beaux Arts Brampton initiated an open call to all muralists in Canada to submit their vison to transform the wall of the Vivian Lane chess park. 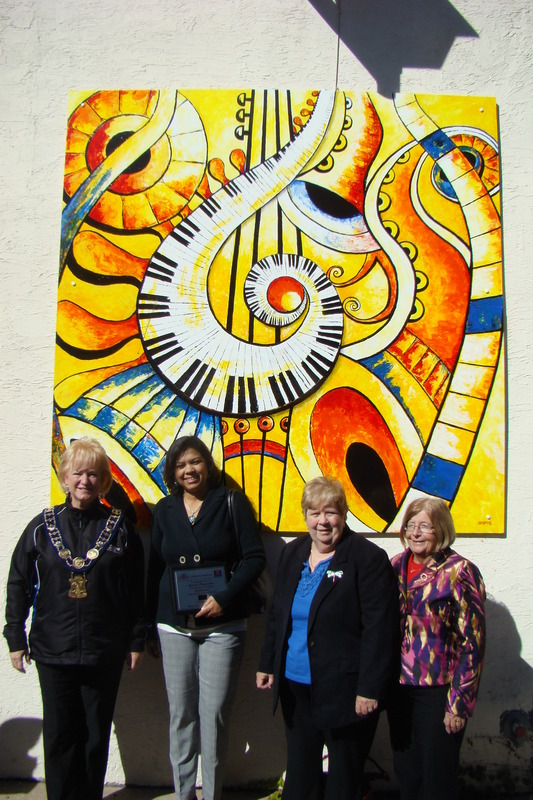 The murals were installed over the weekend and unveiled to public by Mayor Susan Fennell on the 12th of October 2013. It was a fabulous event attended by the visionaries of the Brampton Arts Council, the art community and the art lovers in Brampton. The live band “Fun Fact” played out some great tunes and kept the crowds entertained. Each artist was given a plaque of appreciation. An unexpected but pleasant surprise. I am sure the residents of Brampton are going to enjoy this downtown art spectacle for a long, long time to come. As many of you already knew, I teach art to kids and adults. Have been teaching for more than 10 years now, but was always from home. Decided to take it a notch higher and am partnering with Learna preschool and Tutoring in Milton to start art classes in their facility. We are planning to have a range of classes and course offerings. 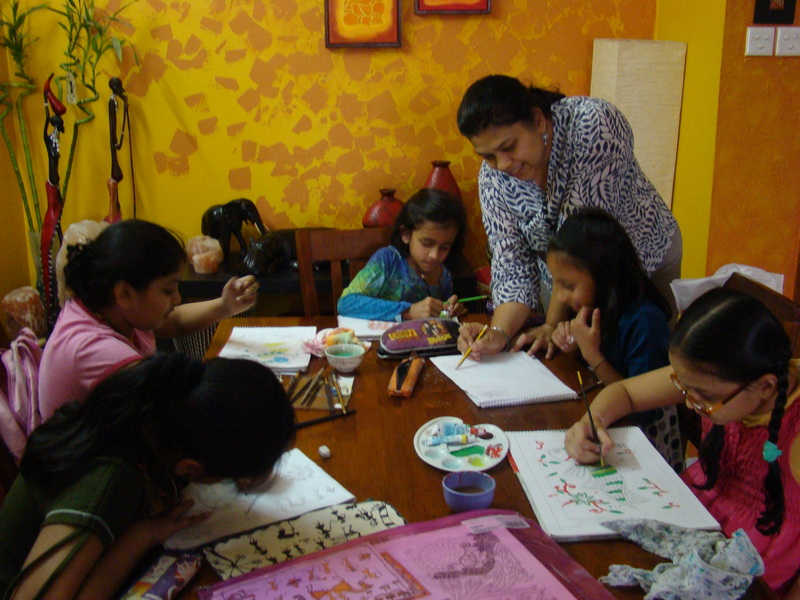 “Art for Tots” for the 3-6 year olds to have fun activities and develop motor skills and also colour and form recognition. 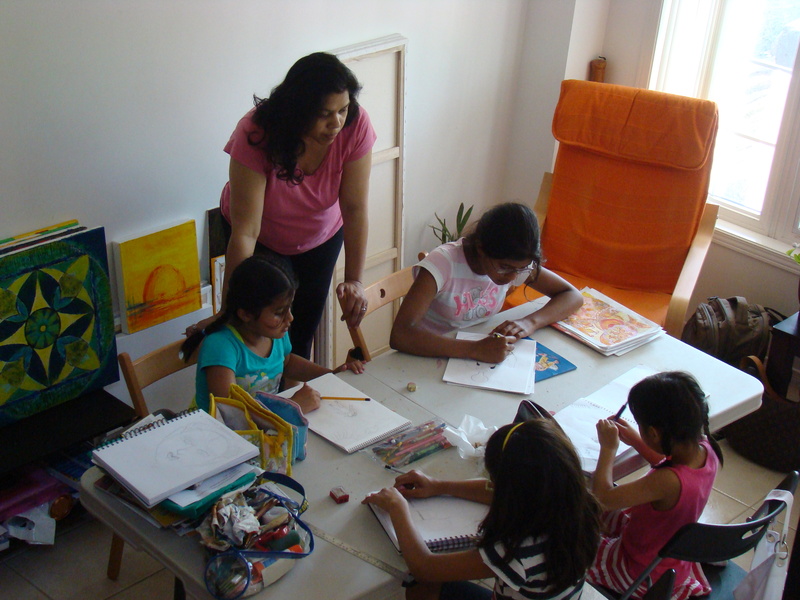 Drawing and painting techniques for the pre tweens and tweens between the ages of 5 – 13 years to develop dominant art skills or bring out the latent ones. And then there are classes for teens and adults who are building a portfolio for further education in art or as their personal accomplishment. Exactly a year ago, my husband and I walked into the Milton Centre for the Arts with a gleam of excitement in our eyes. The foyer was abuzz with activity. 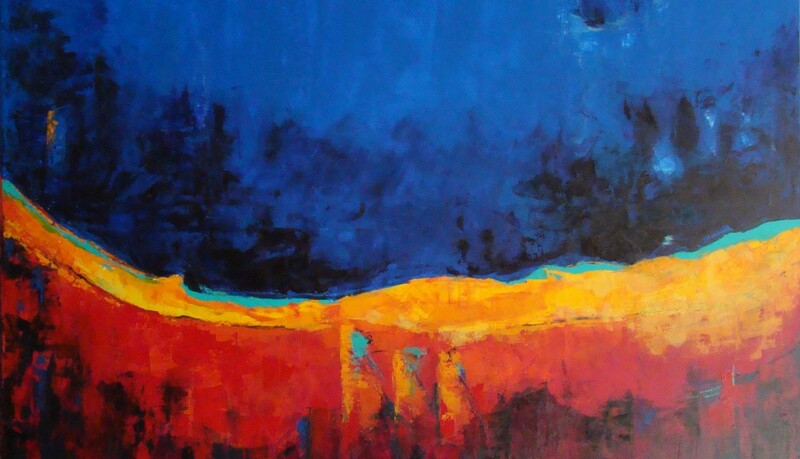 Art was in the air…so dense that you could feel it embrace you. Having just moved to Milton, we were still getting a feel of the place. Both of us are artists by education and feel at home when there is art buzzing around us. And thats exactly what was happening at the centre and we felt like we were back on our mothership! The Culture Days 2012 was on and and various artists from the Town of Milton were hosting various activities for kids, adults. Drawing, Painting, Henna, African Drumming, Singing, Ballet performances, Classical dance forms from various countries, mime performances you name art in any medium, form or genre… it was all happening. And thats when we made a promise to ourselves. Next year we will participate in this event and engage in this truly amazing town of Milton And in 2013, that’s what we did. And thanks to Arts Milton, we could do it in a fashion that was far beyond our wildest dream. We facilitated a community mural at the Milton Centre for the Arts, where residents of this community came and contributed by painting a 6 ft x 12 ft mural.